This casserole of meat, tortillas and tomates verdes is very popular among Americans living in Mexico City and is excellent with "ensalada mixta con aderezo de aguacate". - Grind 2 garlic cloves, the pepper, whole clove, thyme and 1 teaspoon of the salt in a mortar or a molcajete. Transfer to a large bowl, add the beef and mix well. - Heat the oil in a large skillet. Add the onion and sauté until transparent. Add the beef and sauté, uncovered, over medium heat for 10 minutes. Drain and set aside. - Place the chiles serranos in a saucepan of boiling water and cook for 5 minutos. Add the tomates verdes and cook until they change color, about 7 minutes. Drain, transfer to a blender and add 1 garlic clove, the cilantro and 1 teaspoon salt. Purée and set aside. - Roast the chiles poblanos and let sweat for 10 minutes. Cut into strips and set aside. - Remove the stems and pistils from the flowers, being careful not to tear the blossoms. Open the flowers and spread them flat. Place in a skillet with a tablespoon of water and steam for 3 minutes. Set aside. - Preheat the oven to 375ºF (190ºC). Heat 1/2 in (1 cm) oil in a skillet and briefly fry each tortilla on both sides. Arrange 6 tortillas, overlapping, in the bottom of a rectangular baking dish. Cover with a layer of meat, a layer of chile poblano strips and a layer of flowers. Cover with half of the cream and a third of the grated cheese. Make another layer of tortillas, meat, chiles, cream and cheese. Cover with the tomate verde purée, transfer to the oven and bake for 10 minutes. 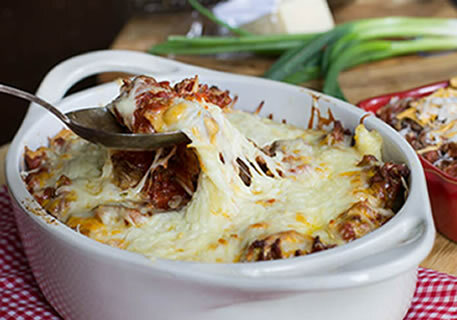 Sprinkle with the remaining one-third of the cheese and bake for 5 minutes or until the cheese melts and browns.